Praised for his strong “sense of theatricality,” Baritone Kenneth Stavert has performed on operatic, concert and recital stages throughout the United States, Europe and Asia. Some of his credits include Guglielmo in Così fan tutte, Figaro in Il barbiere di Siviglia, Silvio in Pagliacci, Papageno in Die Zauberflöte, and Harlekin in Ariadne auf Naxos. He has performed under the batons of conductors such as John DeMain, Neal Gittleman, David Neely, Victor DeRenzi and Christopher Allen and has worked with stage directors such as Nic Muni, Kristine McIntyre, Ken Cazan and Robin Guarino. 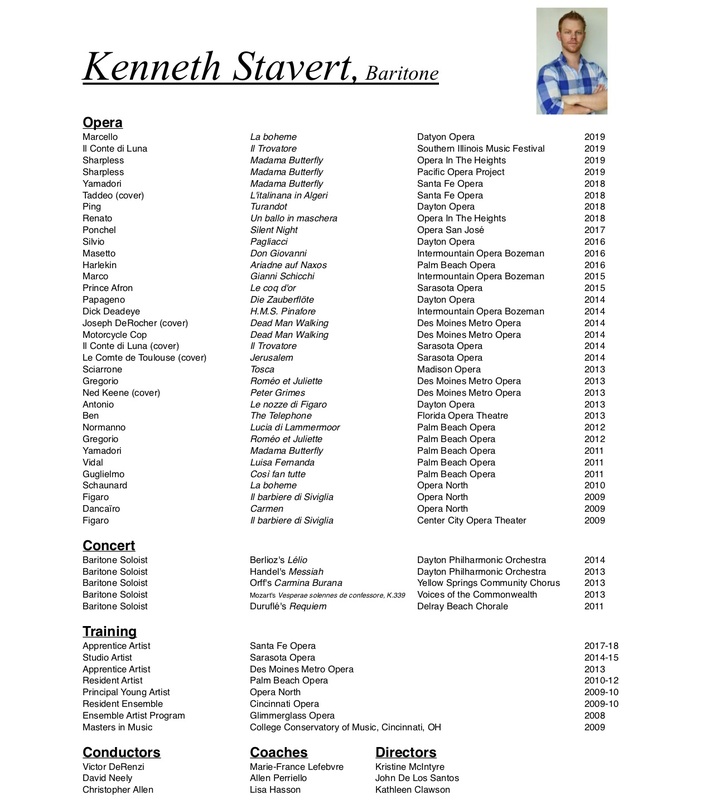 Kenneth’s Orchestral credits include Berlioz’s Lelio, Fauré’s Requiem, Orff’s Carmina Burana, Handel’s Messiah and Mozart’s Vesperae solennes de confessore. He has also been a featured recitalist throughout the United States specializing in less performed English art song. Kenneth has won the 2nd place award in the Southeastern Region of the Metropolitan Opera Competition as well as being a regional finalist in the Central region. He has twice been a winner of the Palm Beach Opera Competition. In 2010 he was a semi-finalist for the Houston Grand Opera Eleanor McCollum Competition for Young Singers, and took first place in the Opera Birmingham competition. In 2011 he was the Grand Prize winner of the Young Patronesses of the Opera / Florida Grand Opera competition. Kenneth Holds a Bachelor of Music in voice performance from the Bob Cole Conservatory of music in Long Beach, California, and a Master of Music degree from the College Conservatory of Music in Cincinnati, Ohio.